Iran has one of the toughest internet censorship campaigns on the planet. However, some VPN software will work to get past its content blocking efforts, so long as you're fully prepared before you enter the country. It’s no secret that Iran maintains a vice-like grip on tech freedom in the country. During the 2009-2012 Iranian protests, known as the “Green Revolution”, this was on full display as Iran blocked most forms of online media going in and out of the country. Nevertheless, the country’s powers-that-be quickly (and some might say unwittingly) learned of the power held by the masses through social media outlets. Evidence of the public unrest appeared prominently on social media websites such as Twitter and Facebook, which Iranian authorities had difficulty blocking at the time. Fast forward several years. The Iranian government has learned a few things. Twitter, Facebook, Youtube and most other social media websites are blocked wholesale, although some Iranian users still manage to get past content blocks in various ways. Even major shopping websites like Amazon and eBay are blocked in Iran, primarily because Iran can’t effectively regulate content on those sites, either. The non-profit organization Reporters Without Borders has listed Iran as an “Enemy of the Internet” since it first began such a list in 2006. (Note: the organization has included the United States on the list since 2014, immediately following revelations of wide-reaching domestic surveillance programs revealed by Edward Snowden). How Does Iran Block Content? As Iran is known to jail and kill dissidents and lawbreakers, most citizens are unlikely to attempt to run afoul of Iranian laws or the country’s filtering efforts. Indeed, circumnavigating Iran’s content blocking is more an activity for the bold. Still, we do at least know a little bit about Iran’s filtering methods, most of which are home-grown or copied from Iran’s closest allies, China and North Korea. As you can see, Iran’s content filtering methods are extremely sophisticated and multi-layered, designed, effectively, to shut off all known attempts to get around the filtering process and cut users off at the heels when they do find a method. NordVPN Our #1 choice. Needs some manual configuration to set up for use in Iran, but worth the effort as it achieves the highest levels of security, detection avoidance and obfuscation on this list. Includes 30-day money back guarantee. IPVanish Solid security features including their custom Scramble feature. Vast array of IPs and servers to chose from. An uncongested network that has good speeds. StrongVPN Solid kill-switch and scramble features. Very good at getting around blocked content, but we’d prefer a kill-switch feature for detection avoidance. VyprVPN Strong security and privacy features. Logging policy may be OK for visitors, but permanent residents and citizens should consider other options. Still, there’s the possibility that some VPNs may work in Iran. The question is, which ones? If you are visiting Iran remember to download the VPN before you arrive since many VPN sites are blocked. Even those that are available within Iran, you most probably don’t want to visit without a VPN in place first to hide your activity. NordVPN has everything you’re looking for in a VPN for Iran. AES-256-SHA encryption, kill switch, a no-logs policy, DNS leak protection, and obfuscation methods. Nord does take a bit of a different approach on some of these than other services. Their obfuscation method, for example, is not their own homegrown method. Instead, NordVPN supports Obfsproxy to deliver this method. They provide a walkthrough for how to set this up. It can be a bit complicated for newcomers, so that is something you’ll want to consider when thinking through your options. Additionally, NordVPN provides a Tor over VPN option. Earlier we mentioned that Tor is one of the few anonymity tools that work in Iran, although speeds get throttled when the systems in place detect it. You may find NordVPN gets around this with a combination of Tor and Obfsproxy. Nord informed us that Obfsproxy and L2TP, PPTP and SSTP all work in Iran. However, you’ll want to avoid PPTP as it’s not secure. NordVPN also utilizes a DNS leak resolver that operates a bit differently than other services. It detects individual leaks, but also utilizes a process-specific kill switch. This way it does not shut off the entire internet connection if you don’t want it to. To top it all off, this service uses a “double VPN” option which is admittedly going to be slow but provides an added level of anonymity necessary for anyone in Iran. NordVPN is one of the cheapest VPNs we’re happy to recommend, it is good value at full price but occasionally runs deals bringing prices down even further. BEST VPN FOR IRAN:NordVPN is our #1 choice. Has a vast range of servers dotted around the globe. Hard to beat on privacy and security features. Allows up to 6 devices to be used simultaneously from one account. Includes a 30-day money back guarantee so you can try them risk-free. IPVanish utilizes the best privacy features we were looking for with our list. AES-256 encryption, a kill switch, obfuscation through OpenVPN, a strict no-logging policy and leak protections. Perhaps one of the larger benefits to IPVanish for an internet user in Iran is the extremely large number of servers and server locations. IPVanish offers up over 40,000 shared IP addresses to be utilized with its 1,300+ servers and 75+ server locations across the globe. This provides anyone in Iran with a lot of options. Notably, IPVanish allows you to toggle their obfuscation method on or off. This option is known as “Scramble”, which you can find in the application’s preferences section. Scramble will allow you to get past network traffic monitors by masking your connection to the VPN service as if it’s a standard HTTPS connection. This may help with the speed throttling that is common in Iran when the system detects the use of a VPN. BUDGET CHOICE:IPVanish can connect up to 10 devices. Uncongested network achieves good speeds. Good privacy and security options. 7-day Money back guarantee. Find out more in our full IPVanish review. A relatively new service, StrongVPN may be a great option for those looking for a high amount of security. In particular, our testing of this service found that their kill switch and scramble features were the absolute highlights for the service. You’ll also find the standards that anyone looking for security and privacy (i.e., anyone in Iran) is looking for: a no-logging policy and multiple forms of extremely strong encryption, from AES-256 to 2048-bit SSL. StrongVPN does not advertise DNS leak protection, although this can be compensated with the kill switch and scramble functions. StrongVPN also gets past the “Great Firewall of China”, meaning it’s likely strong enough to get past Iranian government and ISP filtering methods. That said, remember that the biggest concern for Iran is getting caught, not just getting past. Your biggest concern for this system, perhaps, will be the fact that some servers lack adequate encryption methods. You’ll want to make sure you’re paying attention to which servers you utilize. Find out more in our full StrongVPN review. We want to give an initial warning for VyprVPN: the company informs us that their service does indeed work in Iran. However, VyprVPN has a logging policy, which places a mark against it for anyone in Iran. This makes it a somewhat dubious choice for our list, but one we’ve included as it does hit the other main points, and the logging policy may be an acceptable thing to ignore for anyone spending only a limited time in Iran. The website of Golden Frog (the company behind VyprVPN), is blocked within Iran, however, their .biz site is not so you can sign up within Iran if you haven’t done so out of the country. VyprVPN offers up solutions to the other concerns for anyone using a VPN in Iran. The service utilizes AES-256 encryption, a kill switch, and DNS leak protection. The service includes entirely necessary obfuscation methods. For Vypr, this function is accessible through their aptly-named Chameleon protocol. The Chameleon protocol is VyprVPN’s proprietary obfuscation method which maintains AES-256 encryption. As stated, VyprVPN is a workable option, but primarily for those who may be in the country for a short amount of time. Their logging policy leads us to not recommend this service for anyone from Iran or anyone staying in Iran for the long term. UNLIMITED DATA USAGE:VyprVPN has easy to use apps. Good speeds and uptime as all servers are owned by VyprVPN. Great privacy and security. Not the cheapest option. 30-day money-back guarantee. 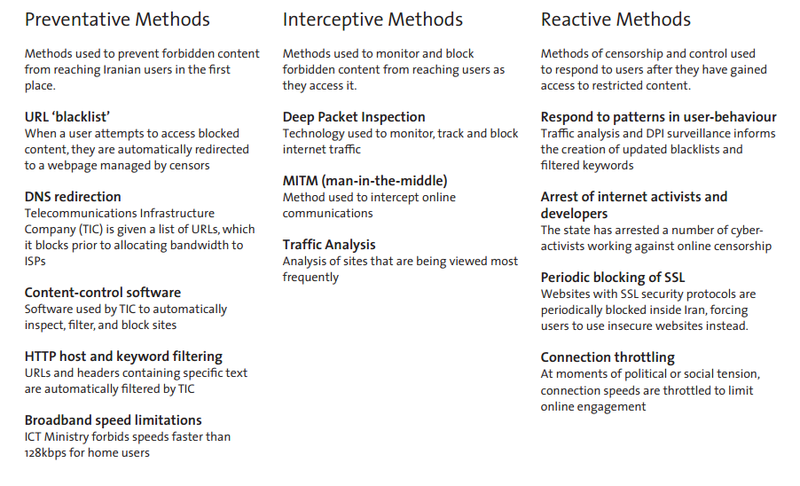 Filtering exists at two primary levels in Iran. The first level exists through the ISPs themselves. There are a handful of ISPs in the country operating independently from the government. All employ filtering methods that block content based on keywords. In 2013, two anonymous Iranians and University of Michigan professor J. Alex Halderman worked together to examine Iran’s content filtering methods. They discovered that half of the websites on Alexa.com’s top 500 websites list were blocked. They also found the majority of those blocked websites, and the majority of search terms automatically filtered, were pornographic in nature. Art, society (e.g., politics), and news websites were also heavily blocked. The second filtering layer exists at the government level. Some websites completely block any IP addresses originating from Iran, resulting in connection attempts that simply time out. Even more interestingly, the aforementioned testing revealed Iran’s content filtering includes connection speed throttling. The throttling is so extensive and sophisticated as to actually block VPN tunneling efforts, including those with obfuscation methods. The research notes that this includes Tor’s obfsproxy protocol. Halderman and the two anonymous Iranians showed that attempts to connect through these proxy methods resulted in connection throttling that slowed speeds down to practically zero, making the connection effectively useless. The blocking of obfuscated SSH tunnels and Tor led the researchers to suggest that Iran’s ISPs and government do not utilize blacklists, but whitelists, meaning unrecognized protocols are even completely disallowed as a standard practice. Additionally, many HTTP hosts are blocked and DNS hijacking is also employed for a number of websites, a filtering method that Halderman found occurs at the national level. The government also utilizes “man-in-the-middle” attacks and Deep Packing Inspections (DPI) to intercept and prevent users from connecting to content. Of course, good luck getting Iran’s leadership to understand that one. Because Iran blocks all forms of social media apps populary used around the world, citizens have a particularly hard time communicating to each other quickly and efficiently. Just this year, major flooding overtook the country, but recovery and rescure efforts were severely hampered due to the blocking of messaging apps like WhatsApp and others. In fact, one Persion BBC reporter called Iran’s censorship a “deadly phenomenon”. Can Iranians or travelers access banned content while in Iran? This is a bit of a tricky subject. Based on Halderman’s findings, it’s reasonable to assume that SSH tunneling, proxies, and even Tor would not work in Iran. Unfortunately, there’s also no real way to test this either. You are about as likely to find VPN servers located in Iran as you are to find ones located in North Korea (hint: no chance at all). What Iran can’t effectively block, they speed throttle into uselessness. However, Bowen and Marchant note that some Tor users found a few methods to get around the throttling by using a “bridge” to a wider network through a secret tunnel. The method works but is not without its faults. 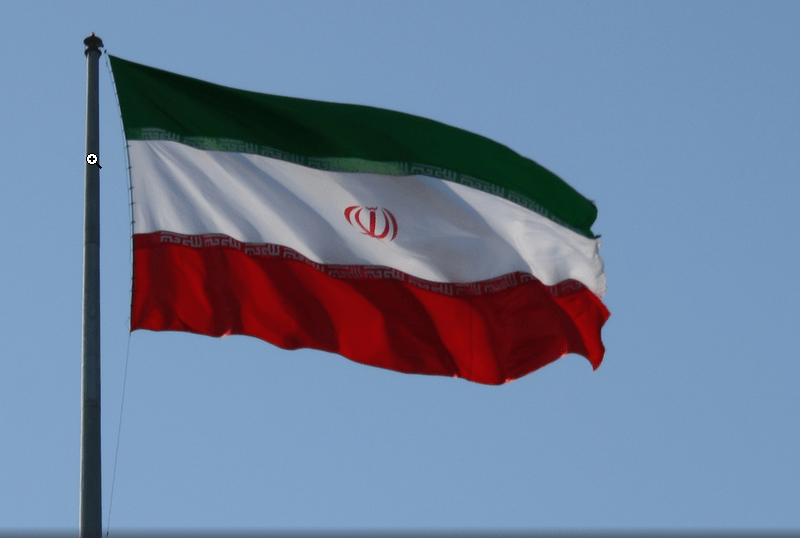 Given Iran monitors usage behavior, they may not be able to detect what individuals are looking at, but they can often detect when users are utilizing encrypted methods, something that would raise red flags. 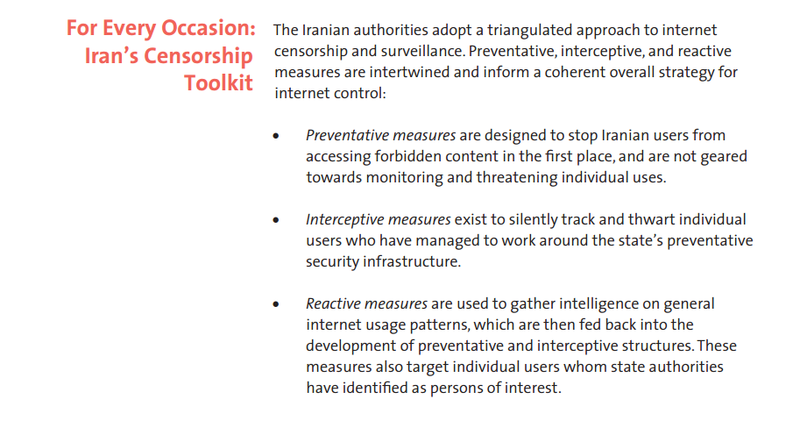 As we’ve detailed above, Iran is an extremely unfriendly place for anyone trying to get past content filtering. Indeed, it’s more than just unfriendly — it’s hostile and potentially dangerous. Iran is known to lock up dissidents and even kill many people who show a propensity to hit the wrong websites too often. And while there can certainly be a good amount of plausible deniability involved when you’re connecting through a VPN with no logging, we can’t guarantee anyone’s safety even then. Iran’s legal system is not known to be fair in the Western sense. If you do plan on traveling to Iran with the desire to connect to banned or filtered websites, make sure you download your VPN first. In fact, you may want to download and install more than one VPN service. Given the ISPs and government’s method of whitelisting instead of blacklisting websites, chances are likely that you will not be able to access VPN service websites after getting into Iran. This being the case, ensure you have a VPN installed before you go. It’s hard to emphasize how important the kill switch and obfuscation methods are going to be for anyone using VPNs in Iran. Given Iran’s current methods, it’s not inconceivable that anyone whose IP address consistently ends up on a watchlist will find themselves in some trouble. Only use VPNs with obfuscation methods, and only use VPNs with a kill switch. Make sure both are turned on at all times. If you plan to be travel to Iran and need access to various types of content Iran is blocking, make sure you have multiple VPNs installed and ready to go, just in case one or more stops working. Iran runs a constant battle against VPNs, meaning some options may go down, long before we’re able to detect these blocks and update our article accordingly. To effectively cover your bypass needs, have a few VPN options ready to go, as any VPN site you may want to use will be unavailable for download once you’re in the country. *Disclaimer: We took care to thoroughly research Iran’s filtering methods. Our goal is to provide users with useful information. However, we cannot guarantee anyone’s safety while using VPNs in Iran. Iran is among several countries where accurate information is difficult to obtain, especially from the outside. We are not experts on Iranian law, and no one outside of Iran knows for certain the extent of their monitoring process or how actively they pursue those who attempt to get past these methods. 1 How Does Iran Block Content? 11.2 Can Iranians or travelers access banned content while in Iran? 7.2 Can Iranians or travelers access banned content while in Iran?